RBTH presents a selection of views from leading Russian media on international events, featuring a report on the first day of the new ceasefire in eastern Ukraine, analysis of the impact of sanctions on the Russian and EU economies, and a focus on the politically-motivated reforms of the Petersburg Dialogue civil forum being implemented by Germany. The Kommersant business daily chronicles the first day of the ceasefire that came into effect in Ukraine on Feb. 15, under the terms of the recent Minsk agreements. However, the paper warns, it would be premature to describe it as a truce: The situation around the key railway junction of Debaltsevo, where a large number of Ukrainian troops are reportedly encircled, remains tense and could “become a trigger for a new escalation in the conflict,” Kommersant writes. Experts polled by the newspaper are concerned that the fighting for Debaltsevo may threaten the new truce, just as the fighting for Donetsk airport undermined the September ceasefire. The situation in the other sections of “the eastern front” on the first day of the ceasefire was calmer than at Debaltsevo. 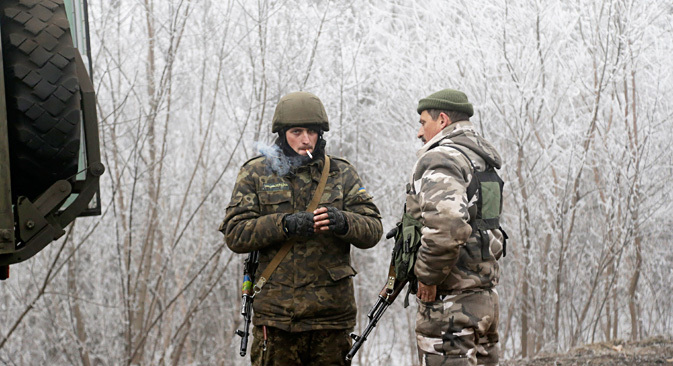 In the first few hours after the start of the ceasefire, hostilities began to subside, gradually petering out into one-off clashes, which allowed both sides to conclude that overall the ceasefire was holding, Kommersant writes. Citing Eurostat, the Gazeta.ru online news website looks at the economic impact the current sanctions are having on the EU and Russia. Last year, the EU’s economy grew by 1.4 percent, thus ending a recession that had lasted three consecutive quarters. Europe’s economic prospects are also looking up: Last week, the European Commission raised its GDP growth forecast for 2015 to 1.3 percent. Having said that, Gazeta.ru continues, the European Commission has pointed out that the quality of macroeconomic forecasts had been recently deteriorating, among other things, because of the high geopolitical risks associated with the situation in Ukraine. “The economic impact of sanctions and counter sanctions may be greater than expected, especially if they become protracted,” Gazeta.ru cites Eurostat as saying. According to Gazeta.ru, the EU’s economic recovery is being impeded by the sanctions imposed against Russia and Moscow’s counter sanctions. However, the website continues, there is too much politics involved in assessments of the impact the war of sanctions is having, which makes it difficult to arrive at an accurate estimate. Russian counter sanctions may cost the EU up to 21 billion euros ($24 bln), whereas the Russian economy may lose up to 50 billion euros. According to the Japanese investment bank Nomura, in 2014, mutual sanctions reduced GDP growth in the Eurozone by 0.2-0.3 percentage points. In Russia, the economic situation – due to the sanctions and the drop in oil prices – is looking even less optimistic: Last year, the country’s economy grew by 0.6 percent, whereas this year it may fall by 3 percent. According to the paper, Petersburg Dialogue has been badly affected by the German cabinet’s adoption of an anti-partnership policy towards Russia. Last year, the German Chancellery went as far as issue a recommendation not to hold civic dialogue events between the two countries. Against this backdrop, a certain increase in activity around Petersburg Dialogue could be interpreted as a ray of hope. However, the Russian paper continues, as far as the German press is concerned, one of Pofalla’s main strong points consists in his critical stance towards Putin’s policies. Furthermore, Nezavisimaya Gazeta adds, a German working group is drafting a reform of the Petersburg Dialogue structure and agenda. The Russian daily concludes that it is too early to judge what the future holds for Petersburg Dialogue. At the same time, it maintains that this channel of communication may continue to play a useful part in bilateral relations.